BBCVladimir Putin was confronted by Steve Rosenberg. 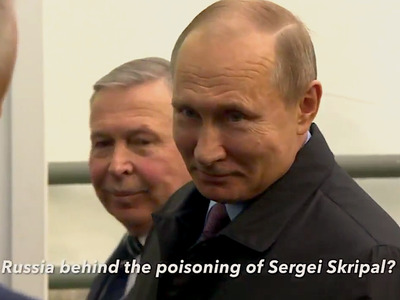 Steve Rosenberg, a BBC journalist, asked Vladimir Putin about the poisoning of the former spy Sergei Skripal. A BBC journalist confronted Russian President Vladimir Putin about the poisoning of the former spy Sergei Skripal and he received a brutal response. Putin almost smirked at the reporter as he considered his answer. “Look, we’re busy here with agriculture,” Putin said. “As you can see, the aim is to create good conditions for people’s lives, and you ask me about some tragedies. Hours earlier, British Prime Minister Theresa May said it was “highly likely” that Russia was behind the nerve-agent attack in Britain last week on Skripal. She has given Moscow until midnight on Tuesday to come up with a meaningful response to the evidence gathered by British investigators. Rosenberg was praised by fellow journalists for his gumption in doorstepping Putin at an event with little to do with Russia’s international relations.